Rutger Oelsen Hauer (Dutch: [ˈrɵtxər ˈulsə(n) ˈɦʌuər]; born 23 January 1944) is a Dutch actor, writer, and environmentalist. He has acted in both Dutch and English-language TV series and films. His career began in 1969 with the title role in the Dutch television series Floris. His film credits include Flesh+Blood, Blind Fury, Blade Runner, The Hitcher, Escape from Sobibor (for which he won a Golden Globe Award for Best Supporting Actor), Nighthawks, Wedlock, Sin City, Confessions of a Dangerous Mind, Ladyhawke, Buffy the Vampire Slayer, The Osterman Weekend, The Blood of Heroes, Batman Begins, Hobo with a Shotgun, and The Rite. Hauer founded the Rutger Hauer Starfish Association, an AIDS awareness organization. Hauer was born on 23 January 1944 in Breukelen, the son of drama teachers Teunke (née Mellema) and Arend Hauer. He has three sisters, one older and two younger. The Hauer siblings grew up in Amsterdam. Since his parents were very occupied with their careers, he and his sisters were brought up mostly by nannies. He went to a Waldorf school. At the age of 15, Hauer ran off to sea and spent a year scrubbing decks aboard a freighter. Returning home, he worked as an electrician and a joiner while finishing his high school diploma at night. Hauer attended the Academy for Theater and Dance in Amsterdam for acting classes, with a short interruption when he was drafted to serve as a combat medic in the Royal Netherlands Army. Hauer joined an experimental troupe, with which he remained for five years before Paul Verhoeven cast him in the lead role of the 1969 television series Floris, a Dutch medieval action drama. The role made him famous in his native country, and Hauer reprised his role for the 1975 German remake Floris von Rosemund. Hauer's career changed course when Verhoeven cast him in Turkish Delight (1973). The film found box office favour abroad and at home, and Hauer looked to appear in more international films. Within two years, Hauer made his English-language debut in the British film The Wilby Conspiracy (1975). Set in South Africa, the film was an action-drama with a focus on apartheid. Hauer's supporting role, however, was barely noticed in Hollywood, and he returned to Dutch films for several years. During this period, he made Katie Tippel (1975) and worked again with Verhoeven on Soldier of Orange (1977), and Spetters (1980). These two films paired Hauer with fellow Dutch actor Jeroen Krabbé. Hauer made his American debut in the Sylvester Stallone film Nighthawks (1981) as a psychopathic and cold-blooded terrorist named Wulfgar. The following year, he appeared in arguably his most famous and acclaimed role as the eccentric and violent but sympathetic anti-hero Roy Batty in Ridley Scott's 1982 science fiction thriller Blade Runner, in which he improvised the famous tears in rain monologue. He went on to play the adventurer courting Theresa Russell in Eureka (1983), the investigative reporter opposite John Hurt in The Osterman Weekend (1983), the hardened Landsknecht mercenary Martin in Flesh & Blood (1985), and the knight paired with Michelle Pfeiffer in Ladyhawke (1985). He appeared in The Hitcher (1986), in which he played a mysterious hitchhiker tormenting a lone motorist and murdering anyone in his way. At the height of Hauer's fame, he was set to be cast as RoboCop though the role went to Peter Weller. That same year, Hauer starred as Nick Randall in Wanted: Dead or Alive as the descendant of the character played by Steve McQueen in the television series of the same name. In The Legend of the Holy Drinker (1989), Hauer showed a more soulful side. Phillip Noyce also attempted to capitalize, with far less success, on Hauer's spiritual qualities in the martial arts action adventure Blind Fury (1989). Hauer returned to science fiction with The Blood of Heroes (1990), in which he played a former champion in a post-apocalyptic world. By the 1990s, Hauer was well known for his humorous Guinness commercials as well as his screen roles, which had increasingly involved low-budget films such as Split Second, Omega Doom, the film adaptation of 'The Beans of Egypt Maine (retitled 'Forbidden Choices)' and New World Disorder. He also appeared in the Kylie Minogue music video "On a Night Like This". In the late 1980s and 1990s, as well as in 2000, Hauer acted in several British and American television productions, including Inside the Third Reich, Escape from Sobibor (for which he received a Golden Globe Award for Best Supporting Actor), Fatherland, Amelia Earhart: The Final Flight as Amelia Earhart's navigator Noonan, Hostile Waters, Merlin, The 10th Kingdom, Smallville, Alias, and Salem's Lot. In 1999, Hauer was awarded the Dutch "Best Actor of the Century Rembrandt Award". Hauer played an assassin in Confessions of a Dangerous Mind (2003), a villainous cardinal with influential power in Sin City (2005) and a devious corporate executive running Wayne Enterprises in Batman Begins (2005). He also played the title role in the 2005 movie Dracula III: Legacy. He also hosted the British reality television documentary Shock Treatment in 2005. He starred in Goal! 2: Living the Dream... as Real Madrid coach Rudi Van Der Merwe. In 2007 he recorded the voice-overs for the UK advertising campaign for Lurpak butter. In 2009, his role in avant-garde filmmaker Cyrus Frisch's Dazzle, received positive reviews. The film was praised in Dutch press as "the most relevant Dutch film of the year". The same year, Hauer starred in the title role of Barbarossa, an Italian film directed by Renzo Martinelli. In April 2010, he was cast in the live action adaptation of the short and fictitious Grindhouse trailer Hobo With a Shotgun (2011). In March 2011, it was announced that Hauer would play vampire hunter Van Helsing in legendary horror director Dario Argento's Dracula 3D. Rutger Hauer starred as Ravn in The Last Kingdom in 2015. Hauer starred as Niall Brigantin season 6 of HBO's True Blood.[when?] In 2017, Hauer voiced the role of Daniel Lazarski in the video game Observer, set in a post-apocalyptic Poland, created by Bloober Team. Lazarski is a member of a special elite police unit that can hack into minds and interact with memories within. In 2019, Hauer provided the voice of Master Xehanort in Kingdom Hearts III, replacing the late Leonard Nimoy. Hauer is a knight in the Order of the Netherlands Lion since 2013. In 2016, Hauer joined the film jury for ShortCutz Amsterdam, an annual film festival promoting short films in Amsterdam. Hauer is an environmentalist. Hauer has also established an AIDS awareness organization called the Rutger Hauer Starfish Association. Hauer married his second wife, Ineke ten Cate, in 1985 (they had been together since 1968). He has one child, actress Aysha Hauer (born 1966), who made him a grandfather in 1987. In April 2007, he published his autobiography All Those Moments: Stories of Heroes, Villains, Replicants, and Blade Runners (co-written with Patrick Quinlan), in which he discusses many of his movie roles. Proceeds from the book go to the Rutger Hauer Starfish Association. The filmography of Rutger Hauer gives an overview of all his performances as an actor in films, television films, and television series from 1969 to present, and also in upcoming films. Lost in the New Real by Arjen Anthony Lucassen (2012) – Narrator/Voight Kampff, lyrics. Hauer is starring as the voice of the main protagonist, Daniel Lazarski in a video game; Observer, Developed by Blooper team. The game was published by Aspyr in 2017. Rutger Hauer also replaced voice actor Leonard Nimoy, after he died in 2015, as Master Xehanort in Kingdom Hearts 3, published by Square Enix in 2019. Rutger Hauer had worked on a couple of previous video game projects before Observer, none of which reached a state of completion. ^ Rutger Hauer: Bescheiden wereldster – Privé | Het laatste Privé nieuws leest u op Prive.nl van De Telegraaf [prive]. Telegraaf.nl (30 November 2009). Retrieved on 2012-12-28. ^ Staff (23 April 1981). "Rutger Hauer Out of Character". Sarasota Herald-Tribune. Associated Press. p. 6E. ^ Andreeva, Nellie (26 September 2014). "Rutger Hauer Joins ABC Fairytale Comedy 'Galavant'". Deadline Hollywood. Retrieved 24 August 2015. ^ Thomas, Bob (7 February 1987). "Hauer Works Hard to Play a Nice Guy". The Spokesman-Review. Associated Press. p. C2. ^ "Rutger Hauer". Hollywood.com. Retrieved 24 August 2015. ^ "BBC Two - Tomorrow's Worlds: The Unearthly History of Science Fiction - Rutger Hauer". Bbc.co.uk. Retrieved 17 January 2018. ^ "Turks Fruit 1973". Rutgerhauer.org. Retrieved 30 May 2008. ^ Alex Billington. "Rutger Hauer Starring in a Full 'Hobo With a Shotgun' Movie". ^ Clark Collis. "Rutger Hauer confirms he will play Van Helsing in Dario Argento's 'Dracula 3D' – EXCLUSIVE". Entertainment Weekly. ^ Chalk, Andy (20 July 2017). "A new Observer trailer reveals Rutger Hauer as a Blade Runner-like 'neural detective' - PC Gamer". PC Gamer. Future plc. Retrieved 3 June 2018. 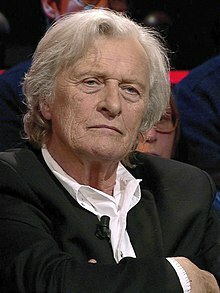 ^ (in Dutch) "Acteur Rutger Hauer krijgt lintje", NOS, 2013. Retrieved on 12 February 2015. ^ "Rutger Hauer en Jan Harlan treden toe tot Shortcutz Amsterdam juryteam". filmfestival.nl. 6 March 2016. Retrieved 26 August 2016. ^ Howell, Peter (21 March 2011). "Rutger Hauer prefers to shoot quips, not guns". The Toronto Star. Retrieved 23 August 2015. ^ Rutger Hauer Starfish Association. Accessed 2008-05-30. ^ "Acteur - Ayesha Hauer". Filmgek.nl. 14 December 1987. Retrieved 6 October 2017. ^ Rutger Hauer and Patrick Quinlan. All those moments: stories of heroes, villains, replicants, and Blade Runners, New York, NY: HarperEntertainment, 2007. ISBN 0-06-113389-2. ^ Todd Leopold. "'Blade Runner' actor on 'strange profession'". CNN.com. Retrieved 12 June 2007. This page was last edited on 19 April 2019, at 03:30 (UTC).